On the night of November 19, 1995, a fire broke out at the Town Hall in the village of Wem, not far from Shrewsbury, Shropshire. The building was engulfed in flame when a local man named Tony O’Rahilly stood across the road and snapped a photo of the front entrance, capturing what is inarguably one of the eeriest ghost images of all time. 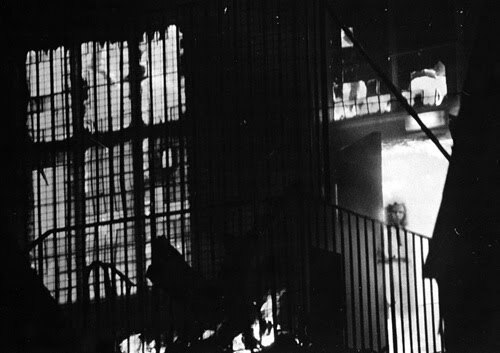 In the developed black and white photo, a young girl is standing behind a railing, inside the burning building. A loose, slightly old-fashioned white dress falls to her knees. She gazes out into the night with an unreadable expression, seeming to stare directly at the camera. O’Rahilly and villagers who were standing near him when the photo was taken claimed they didn’t see the girl at all, and by all accounts there was no one inside the Town Hall as it burned. O’Rahilly denied any trickery. Dr. Vernon Harrison, a former president of the Royal Photographic Society, concluded the image had not been doctored after examining the photo and its negative. Like many skeptics, however, he surmised that the “girl” could be an optical illusion created by smoke and shadow. Experts at the National Museum of Photography declared the photo a fake. Others considered O’Rahilly’s photo evidence of the afterlife, and set to work figuring out who the girl in the fire could be. Some came to believe she was 15-year-old Jane Churm, the girl responsible for accidentally started another famous fire in Wem in the year 1677. On the night of November 3, Jane set the thatched roof of her home on fire by carelessly placing a candle too close to it. As it was dry and windy, the flames spread rapidly and devoured numerous other cottages in Wem. One man tried to hide beneath his house, and it collapsed on top of him. Now, more than three centuries later, Jane had returned to Wem to haunt another fire. For the past 15 years, the girl in the fire has appeared on virtually every list of the most chilling, and the most convincing, ghost photos. Wem even added “Ghost Town” to its sign. In May of this year, the Shropshire Star newspaper included a 1922 Wem postcard in its “Pictures of the Past” feature. The black and white photo showed a street lined with shops, and outside one of those shops stands a solemn young girl in a loose-fitting white dress and a frilled white bonnet. She looked much like the girl in the fire. Reader Brian Lear of Shrewsbury alerted the paper to this eerie resemblance, which turned out to be more than coincidental: Both the girl in the fire and the girl in the postcard wear black neckties of exactly the same width and length, the blouses of their dresses are wrinkled near their waists in precisely the same spot, the frills of their bonnets cover their hair in the same places, and their faces are identical. As an overlay demonstration by computer programmer Richard Deeson shows, the two pictures are the same. But why the photo was faked may forever remain a mystery. Tony O’Rahilly died in 2005. This entry was posted in Fraud, Ghosts, Hoaxes and tagged ghosts, hoax, paranormal, photography. Bookmark the permalink. I found a great deal of effective info here!